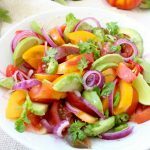 Creamy, healthy and tasty heirloom Tomato Avocado Salad with purple onions and cilantro, in a zesty olive oil lime dressing! 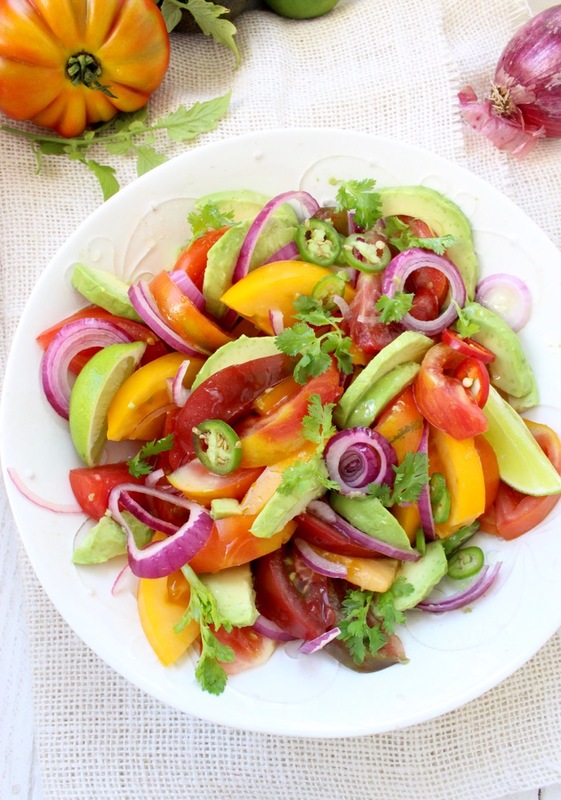 The perfect, California style summer salad to serve next to grilled chicken, shrimp or steak. Add some feta, queso fresco or blue cheese on top If you want and call it lunch. If your tomatoes are more on the acidic side I’d suggest adding a drizzle of honey to the dressing. 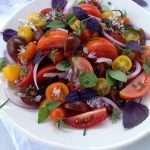 This is the time to splurge on those sweet, colorful heirloom tomatoes at the market, the mix of flavors are simply out of this world. Magic is happening! Much like Penelope Cruz and Javier Barden kind of magic. I hope that really makes sense to those of you not in Hollywood. Because to be honest, I really have no clue where that came from..
You want to use ripe avocados here, but not too soft. We want them to still hold together when tossed with the tomatoes, olive oil and lime juice. They will form the silkiest, creamiest, most delicious dressing you can dream of. Also, keep in mind this is the kind of salad you want to toss together just before serving, since avocados don’t keep well. 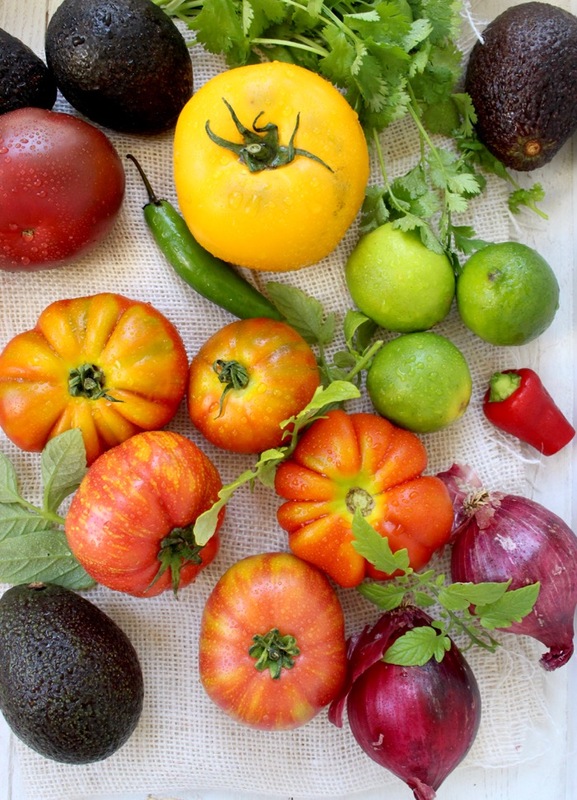 By the way, did you know that tomatoes are actually berries, and avocado is a fruit ? Go figure.. So technically this is a fruit salad. Just saying, you can google it! 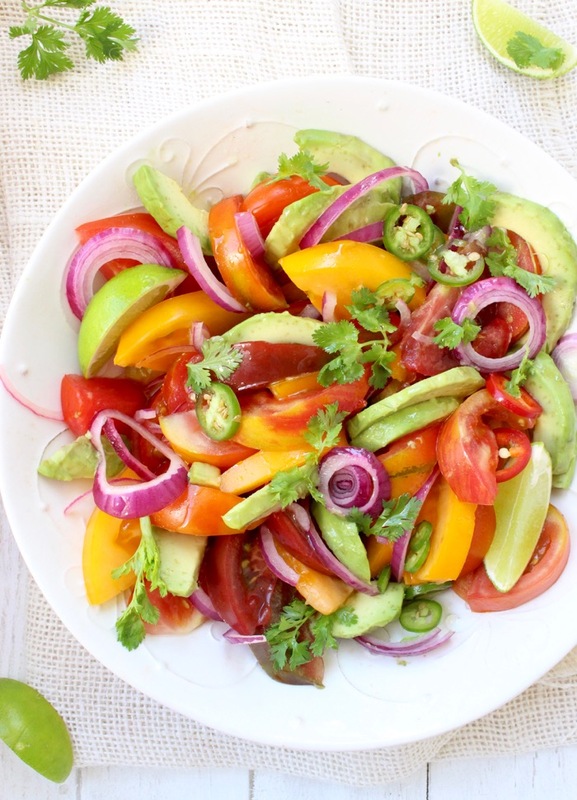 California style tomato avocado salad in a zesty olive oil lime dressing, with purple spring onions and spicy chili peppers. 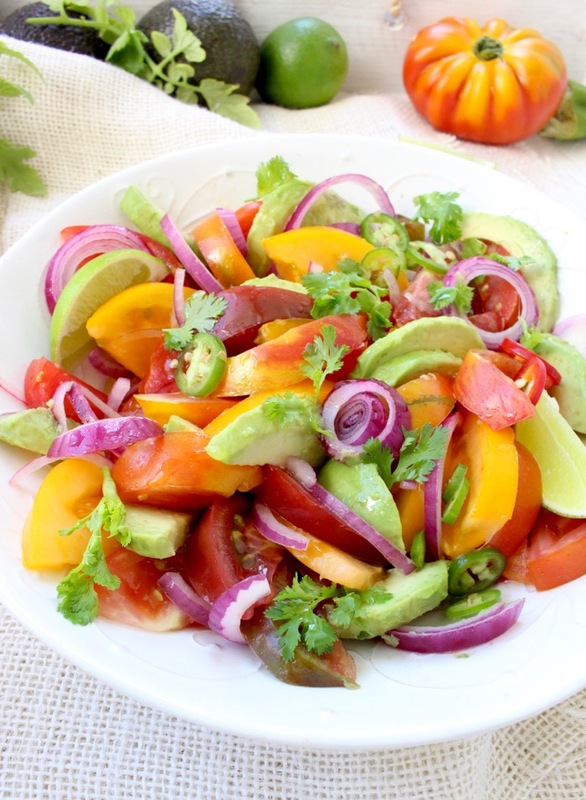 Slice the tomatoes and avocados into wedges and transfer to a serving bowl. Slice the red or purple spring onions into rounds. 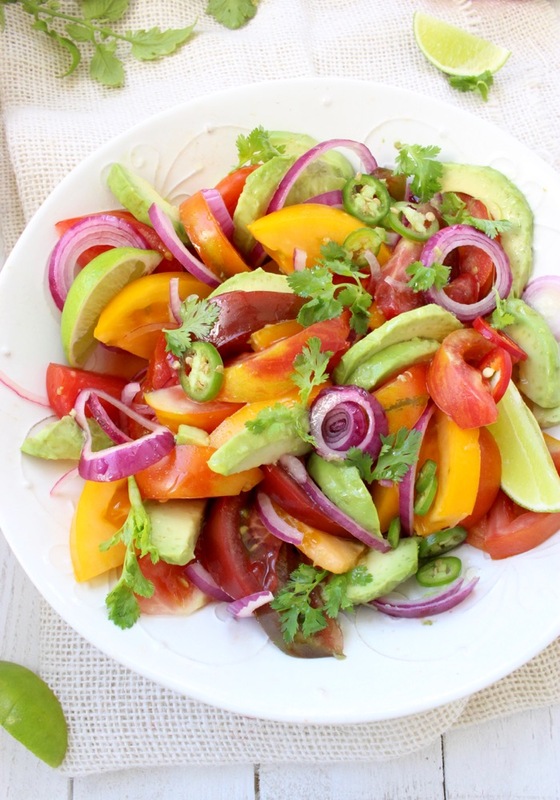 Pour the olive oil lime dressing over the sliced tomato, avocado, onions and chili pepper just before serving. Give the salad a super gentle toss to coat all over and form this silky avocado dressing. Adjust seasonings again with more sea salt or lime juice. Sprinkle with the cilantro leaves and chile pepper slices to taste. Serve with extra lime wedges on the side. In a small bowl whisk together the olive oil, lime juice and lime zest. Season to taste with the sea salt. Adjust seasonings 11 times until happy. Pour over the salad and enjoy! Oh man! Those tomatoes! 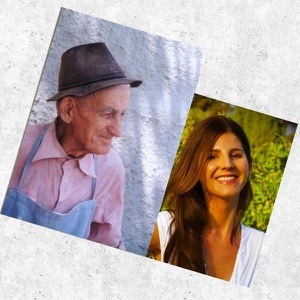 They are gorgeous…also like Penelope & Javier! Haha! 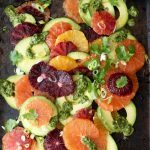 Gorgeous, simple salad that looks very satisfying! I love how bright and fresh this is! Heirloom tomatoes are the best part of summer!! So simple but so colorful, fresh and tasty. Thanks for the recipe! if this doesn’t scream summer I don’t know what does!!! What a gorgeous salad. You just can’t beat the flavor of fresh tomatoes. I am in love! 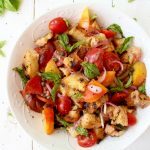 I love everything about this salad and I really wish I grew some heirloom tomatoes this year! I really need to head to the farmers market for some heirloom tomatoes. 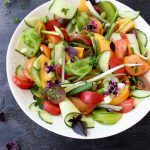 This salad sounds simply amazing! Wow I love this colorful salad! It’s so pretty with the different kinds of tomatoes!